She's made comments referencing an old anti-Semitic canard that Jews have magical powers ("Hypnotising America" ) and that Jewish money lay the foundation of America's support for Israel. All made in a professional setting. The Labour party is constantly smeared 'anti-semitic' by the tax avoiding offshore billionaire media owners publications -Daily Mail, Telegraph, Express and Murdoch for having the temerity to question Israels illegal settlements and murder of Palestinians. They also do this because Labour have threatened to crackdown on tax avoiding offshore media barons. Hasbara is Hebrew for The Explanation. It is the official multifaceted, holistic, systemically controlled state (extrapolated out to global levels) propaganda campaign/infrastructure by not just the Israeli government but the Zionist jewish diaspora itself. Think AIPAC in the USA, the MSM in the entire West, the Bretton Woods international banking system (as well as the multinational private banks) , Hollywood, many structural parts of worldwide universities, most neocon and neoliberal think tanks, the MIC within most of the US/UK/NATO superstructure, etc. etc. etc. These move in hyper-complicated interlocking (both direct and indirect) mechanisms at a multiplicity of levels to promote and control and ensure that the narratives and geo-political, geo-cultural, geo-economic, geo-military outcomes always are steered to favour and empower that particular small, tribalist, racist, supremacist group. Endless wars, endless debt (at all levels from personal up to commercial, from municipal, up to state/provincial levels, from national up to supranational) endless 'strategies of tensions' at all levels, from socio-cultural, socio-economic, up to military at massive trans continental levels. Also the use of systemic banking control to weaken all resistance and put the boot-heels to the so-called middle-class of the West and other parts of the world (think austerity regimes and IMF/World Bank crisis capitalism and state economic dis-empowerment.) who are the natural bulwarks against the entire systemic control. A perfect example is the Arc of Crisis. From the Western part of Africa, up through the Maghreb, over into the Levant, then the Middle East, and onward into Afghanistan, etc, right up to the door of China and southern Russia. Light it up with decades of war, which in turn causes massive inflows of refugees spilling into the West, thus destabilising their populations. When the Bush/Blair regimes leave power after spinning up Iraq and Afghanistan, you bring in Obama (war slag Clinton included) and other neoliberal pro-empiric war Euro leaders who then crush Libya, and try to crush Syria, etc, with the endgame in that arena being the destruction of Iran. Again, she referenced an old Jewish Canard that Jews have magical powers by saying the Jewish State "hyponotised America." Again, she referenced an old Jewish Canard that Jews have magical powers, and referenced it in her comments that they "hyponotised America." I disagree , you are pulling it out of political critique context. Any criticism of zionism and the barbarous acts of Israel automatically become anti-semitic when it is run through their spin machine. Meanwhile they talk about the Palestinians in the most vile, de-humanising terms and then act out on that paradigm they have created. Note: Only Ben-Gurion honestly admitted why Palestinians were so upset by Israelis; and only he, among Israel's Prime Ministers hoped to reconcile Zionism with minimal disruption to the indigenous population. Nevertheless, Ben-Gurion and many of his successors have long strings of anti-Palestinian remarks which have been documented. . . among them. . . .
---- : "We must expel Arabs and take their places." ---- : David Ben Gurion, 1937, Ben Gurion and the Palestine Arabs, Oxford University Press, 1985. ---- : “We must use terror, assassination, intimidation, land confiscation, and the cutting of all social services to rid the Galilee of its Arab population." ---- : David Ben-Gurion, May 1948, to the General Staff. From Ben-Gurion, A Biography, by Michael Ben-Zohar, Delacorte, New York 1978.
country. Why would they accept that?" Quoted by Nahum Goldmann in Le Paraddoxe Juif (The Jewish Paradox), pp. built in this country that did not have a former Arab population." Weidenfeld and Nicolson, 1978, p. 99. 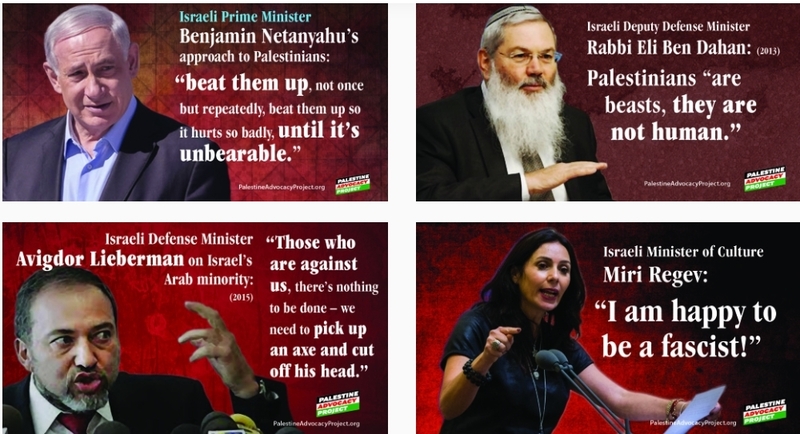 ---- : “The country is theirs [the Palestinians], because they inhabit it, whereas we want to come here and settle down, and in their view we want to take away from them their country." ---- : David Ben Gurion, quoted on pp 91-2 of Chomsky's Fateful Triangle, which appears in Simha Flapan's "Zionism and the Palestinians pp 141-2 citing a 1938 speech. ---- : "There is no such thing as a Palestinian people... It is not as if we came and threw them out and took their country. They didn't exist." ---- : Golda Meir, statement to The Sunday Times, 15 June, 1969. ---- : "How can we return the occupied territories? There is nobody to return them to." ---- : Golda Meir, March 8, 1969. ---- : "Any one who speaks in favour of bringing the Arab refugees back must also say how he expects to take the responsibility for it, if he is interested in the state of Israel.. . . .
---- : “It is better that things are stated clearly and plainly: We shall not let this happen." would be ridiculous to ask it to account for its legitimacy." ---- : “Ben-Gurion waved his hand in a gesture which said 'Drive them out!’"
---- : Yitzhak Rabin, leaked censored version of Rabin memoirs, published in the New York Times, 23 October 1979. ---- : "[Israel will] create in the course of the next 10 or 20 years conditions which would attract natural and voluntary migration of the refugees from the Gaza Strip and the west Bank to Jordan.. . .
---- :. . . To achieve this we have to come to agreement with King Hussein and not with Yasser Arafat." ---- : Yitzhak Rabin (a "Prince of Peace" by Clinton's standards), explaining his method of ethnically cleansing the occupied land without stirring a world outcry. 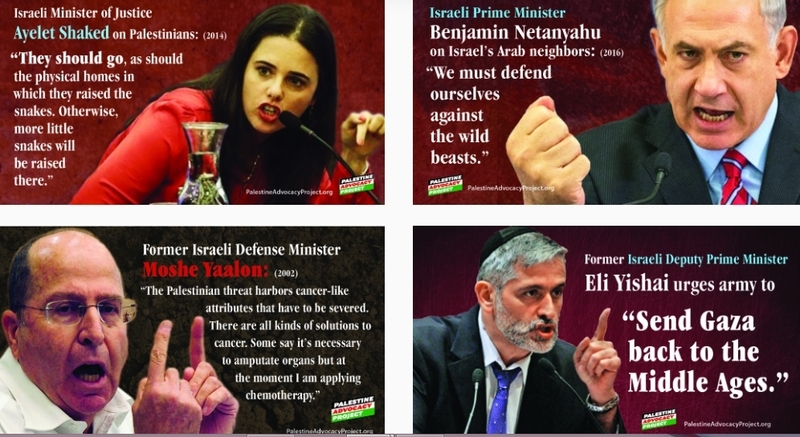 ---- : "[The Palestinians] are beasts walking on two legs." ---- : Israeli Prime Minister Menachem Begin, speech to the Knesset, quoted in Amnon Kapeliouk, "Begin and the 'Beasts,"' New Statesman, June 25, 1982. ---- : . . . .“Jerusalem was and will for ever be our capital. Eretz Israel will be restored to the people of Israel. All of it. And for Ever." ---- : Menachem Begin, the day after the U.N. vote to partition Palestine. ---- : "The past leaders of our movement left us a clear message to keep Eretz Israel from the Sea to the River Jordan for future generations, . . .
---- :. . . for the mass aliya (=Jewish immigration), and for the Jewish people, all of whom will be gathered into this country." ---- : Former Prime Minister Yitzhak Shamir declares at a Tel Aviv memorial service for former Likud leaders, November 1990. Jerusalem Domestic Radio Service. ---- : "The settlement of the Land of Israel is the essence of Zionism. Without settlement, we will not fulfill Zionism. It's that simple." ---- : Yitzhak Shamir, Maariv, 02/21/1997. ---- : "(The Palestinians) would be crushed like grasshoppers ... heads smashed against the boulders and walls." ---- : "Israel should have exploited the repression of the demonstrations in China, when world attention focused on that country, to carry out mass expulsions among the Arabs of the territories." ---- : Benyamin Netanyahu, then Israeli Deputy Foreign Minister, former Prime Minister of Israel, speaking to students at Bar Ilan University, from the Israeli journal Hotam, November 24, 1989. Ehud Barak, Prime Minister of Israel at the time - August 28, 2000. ---- : "If we thought that instead of 200 Palestinian fatalities, 2,000 dead would put an end to the fighting at a stroke, we would use much more force...."
---- : Israeli Prime Minister Ehud Barak, quoted in Associated Press, November 16, 2000. ---- : "I would have joined a terrorist organization." ---- : Ehud Barak's response to Gideon Levy, a columnist for the Ha'aretz newspaper, when Barak was asked what he would have done if he had been born a Palestinian. ---- : . . and now the current Prime Minister, a favorite of mine because he speaks plainly on this issue you deny. ---- : "It is the duty of Israeli leaders to explain to public opinion, clearly and courageously, a certain number of facts that are forgotten with time. . . .
---- : . . .The first of these is that there is no Zionism, colonialization, or Jewish State without the eviction of the Arabs and the expropriation of their lands." ---- : Ariel Sharon, Israeli Foreign Minister, addressing a meeting of militants from the extreme right-wing Tsomet Party, Agence France Presse, November 15, 1998. ---- : "Everybody has to move, run and grab as many (Palestinian) hilltops as they can to enlarge the (Jewish) settlements because everything we take now will stay ours...Everything we don't grab will go to them." ---- : Ariel Sharon, Israeli Foreign Minister, addressing a meeting of the Tsomet Party, Agence France Presse, Nov. 15, 1998. ---- "Every time we do something you tell me America will do this and will do that . .. .
---- : . . . I want to tell you something very clear: Don't worry about American pressure on Israel. We, the Jewish people, control America, and the Americans know it." ---- : Israeli Prime Minister, Ariel Sharon, October 3, 2001, to Shimon Peres, as reported on Kol Yisrael radio. ---- : "Israel may have the right to put others on trial, but certainly no one has the right to put the Jewish people and the State of Israel on trial." I googled the phrase “anti-Palestinian tropes.” Nearly all the articles I saw were about Omar’s alleged antisemitism. I then used the advanced search feature and found a thread on “anti-Palestinian tropes” from Yousef Munayyer. It is safe to say that concern over anti-Palestinian racism and concern about anti-Palestinian tropes is virtually nonexistent in mainstream American politics or the media. People in those venues seem unaware that such concepts could exist, let alone wonder whether they themselves might be influenced by them. Most people who write for or read papers such as the NYT are probably upper middle class or above and see themselves as liberal and sophisticated. They judge others by the standards they hold and it doesn’t occur to them that they might have their own moral blindspots and their own taboos, some justifiable and some not. Ilhan Omar is not part of their bubble. She said things which upset them, so for them the issue is whether she did this out of deliberate malice or did she just stumble into it out of ignorance? The fact that she upset them twice in one month has caused an upheaval of sorts. One finds liberals defending Omar by treating her as an unsophisticated immigrant who doesn’t know the minefields of this topic. This comes from people who see themselves as her nuanced frustrated critical defenders, like Michelle Goldberg. Nancy Pelosi has also adopted this stance. It might be useful to think of what to say to pundits and American liberals in general who live inside this bubble, complacently assuming that they have the understanding and moral authority to determine how the Israel-Palestine issue should be discussed. I exist in this bubble myself and might still be under its influence. Still, here are my suggestions for Americans on anti-Palestinian tropes to avoid when writing about antisemitic tropes to avoid. If you fall into such tropes, you run the risk of encouraging anti-Palestinian racism. A sincere liberal wouldn’t want to do this. They might fall into using anti-Palestinian tropes in the way they think people less sophisticated might blunder into saying something antisemitic, but they should want to avoid doing this. Of course some or many of Omar’s critics are anti-Palestinian bigots who do not wish to change, but this piece is written for liberals who would not want to spread racism if they were made aware of how they might be doing so. Boom. You just stepped on a mine. It is possible to say this without intending anything anti-Palestinian. You might be arguing, as some have, that Israel has the legal right (like any other nation no matter how bad its human rights record) to exist inside well-defined borders without being invaded, though we could then move on to that topic of the human rights violations. One could argue about all this. It sounds funny talking about the sacred nature of borders coming from any American given how often we invade or bomb or support terrorist attacks on others and also given the ill defined location of Israel’s borders. But there is no need to argue about it, because few people mean it that way. What the phrase actually means in most cases is that Palestinians have no right to exist in their own homeland so don’t bring it up or you are an antisemite. The sentence is meant to shut down any moral judgement about the Nakba, or preferably any mention of it at all. One can employ the concept without using the actual sentence. See, for instance, Roger Cohen’s recent attack on Jeremy Corbyn, where Cohen says he is a proud Zionist and gives a one line history of 1948, complete with parenthetical invading Arab armies. One could say something about that invasion, which came weeks after the April 9 massacre at Deir Yassin and the generation of 300,000 Palestinian refugees and which in the case of Transjordan was an invasion of the land to be granted the Palestinian State– but never mind. The big point here is that Roger Cohen leaves out the Nakba. Cohen wants to make a case for Zionism based on the threat of antisemitism. If he asked me what Jews in the 1930’s should have done facing the Nazi threat, I have no good answer. The threat was real and became genocidal. Even the countries opposed to Nazism were permeated with antisemitism to varying degrees. There was clearly an extremely urgent need for a refuge for Jews in that era. But I know the Nakba was an enormous crime, two wrongs don’t make a right, and it is impossible to have a serious discussion about Zionism without even mentioning the Nakba. Some would try to justify it. Mr. Cohen, I imagine, realizes he can’t bring himself to do this, so he solves the problem by not mentioning it. To some degree Zionist arguments prevail with Western Christians because of Christian guilt. Christians know that Jews were persecuted over the centuries because of Christian antisemitism. Supporting Zionism and ignoring the crimes committed by Israel amounts to a cheap way to atone. The Palestinians become the scapegoats for the crimes of others. Of course, as they are not willing scapegoats, they have to be demonized to justify their treatment. Trope 2. “Israel has a right to defend itself”. This is always stated after Israel has committed some war crime. American politicians cite it like some sort of mantra. It is immoral to use this trope to excuse war crimes. But invariably, whenever Israel kills civilians you will find America politicians saying that Israel has a right to defend itself. Obama said this during the Gaza War of 2014, in which Israel defended itself by killing around 1500 civilians including 500 children. Several dozen Israelis died, including six civilians. Mainstream US politicians seem comfortable with calling all this self defense. Israel continues to shoot unarmed Palestinian protesters. Last year, the New York Timescarried four columns defending this practice and putting all the blame for the deaths on Hamas. Two of these columnists, Bret Stephens and Tom Friedman, now condemn Omar. Can anyone imagine the New York Times publishing a piece defending a Palestinian terror attack on civilians as justified because Palestinians have the right to defend themselves, one which said that the blame should fall entirely on Israel? What would the reaction be if they did? There would be a nationwide uproar, because a defense of the murder of Israeli Jewish civilians would be rightly seen as a moral outrage , but the murder of Palestinians is just a PR problem for Israel and not in any sense a moral outrage. If people defend it, they get space in the New York Times to do so and there is no fuss about this at all. Cohen and Goldberg work there. I gather that there is apparently a policy in place forbidding New York Times columnists from criticizing each other by name, or criticizing the editors. But they could write columns criticizing the callous contempt of some of Israel’s American supporters without naming their colleagues. Will they? I don’t know. I agree. But for most of those who say this, it is empty rhetoric. How many of the people saying this about Omar actually write articles condemning Israeli apartheid or war crimes or the indecency of those who defend them? And what exactly did Omar say that was inaccurate regarding the Lobby? It is almost certainly true that part of Omar’s crime was criticizing the Lobby while being a Muslim. But even Bret Stephens condemns Islamophobia. Bret Stephens, the honest critic of Israel and foe of Islamophobia, actually gets to strike that pose in the same paper that prints his defense of killing protesters. Kamala Harris, Bernie Sanders and Warren have weighed in with statements that painted Omar as a victim of Islamophobia — which she is — without mentioning that she’s also a purveyor of anti-Semitic bigotry — which she surely is as well. And notice that the instant an accusation of antisemitism is made, it immediately takes center stage, while Palestinian rights, never very important to begin with, fade away to the level of a meta- topic if they are mentioned at all. Yes, theoretically we are told, you could say some mean things about settlements and Netanyahu. It won’t make any difference to our support for Israel if Israel just brushes it off, of course. It never has. People have been criticizing Israel for decades and we continue to support them. It is Kabuki theater. Let’s move on. Goldberg is angry that Republicans who are far more bigoted than Omar (in her view, Omar is a bit of a bigot) get away with so much. This is the safe way to defend Omar. To Goldberg, the other Democrats are the heroes of the story, trying to figure out how to punish Omar for her “mild antisemitism” (Goldberg’s words, not my view) while not letting the bigoted Republicans get away with anything. Could there be anti Palestinian bigotry in the Congresspeople of both parties who give billions every year to Israel no matter how badly Israel treats Palestinians? Should these people be criticized for their cowardice or apathy or bigotry? It doesn’t seem to be a question that any of Omar’s critics wish to ask. Omar is not part of the club, so she can be called a bigot. As it turns out, she has supporters in Congress, so Congress decided to condemn all forms of bigotry except the one they nearly all practice, which is anti-Palestinianism. I sound sarcastic here, yet believe it or not I am trying to avoid any cheap sarcasm. Much of our political discussion in America makes sense if you think of it as the behavior of high school cliques. That extends well beyond this topic, but I digress. Just because others do it doesn't justify her actions. She knew exactly what she was referencing when she said "The Jewish state has hypnotised the world" . Even Pelosi labeled her comment as Anti-Semitic and forced urged her to apologise.